To the right you can see the men selling the peeled cucumbers, a cool snack on an already hot day. The men stood there gabbing and staring. Once ina while someone would say something which brought a smile to their lips, but I didn't see laughter. There were also men selling toys and trinkets. One man even selling bags of popcorn. It is here that you would board a boat out to Elephanta Island. Next time we'll take the boat as is it's been recommended highly to me by numerous people. Following the Gateway, our taxi driver brought us past this amazing Mosque. Amazing to behold. Below I've posted two photos -- one of the Mosque way out on the point, and one of Dan photographing it so you can see just how far away and large it was! From here he brought us to a beautiful Jain Temple. One of the folks I work with here in Mumbai follows the Jain religion as did the taxi driver. I wish I'd known more about what I was looking at. The guide books we had spoke very little about this religion. I know it's followers are not only vegetarian, but eat no root vegetables. They also are known for being extreme animal lovers. After the temple visit, we had the long ride to the airport. Long due to the tremendous traffic, not distance. I cannot stress enough the traffic here. WOW! Bicycles here, as in China, are used to carry everything! At left you can see the 3 wheeled bike carrying a load of gas tanks. They could be empty or full! They also pile everything and anything on top of the taxis. They have too with the taxis all being so very tiny!! This was the car in front of us as we journeyed out to the airport. I had thought as we passed these people cooking (photo right) that I'd really love to stop and buy some lunch, but this was one of the areas where the traffic actually WAS moving. We arrived at the Mumbai airport and had to pass all of our luggage through the scanning machines where they would be bound by a machine to show they had been scanned. After checking in, we made our way to the gate. Security check was at the actual gate. Men to one side, women to the other. We didn't realize this and Dan was quickly ushered to the other line. After a quick check of my bag we sat down to await boarding. No. I did NOT get any photos of this all. There were enough military handy to keep my camera in my bag thanks. As we boarded the flight we passed by the fellow that had assisted us at check-in. Dan asked him if it has really been a threat or simply an exercise. The reply was got was only a forced smile and a nervous giggle with a head nod for us to move long. No formal answer. From here we were hustled onto the plane, seated and voila! We're off to Sri Lanka! This was the first flight I'd been on where they sprayed something into the air on the plane to kill any bugs that might be on it. It smelled awful -- I can't imagine it's "OK" for you to inhale. That poor flight crew! I passed out on the flight over. It was SO SHORT! Only about 2 hours. We landed at the Bandaranayake International Airport and gathered our bags. I was pushing the cart and stopped to exchange some money while Dan went ahead to arrange a taxi. As I rounded the corner, a man with a safety vest came over and said he'd push my cart. I told him no thank you. He physically pushed me off my cart and took off ahead with it. (I was fuming!) We got through the doors to the taxi area where Dan had arranged a car and he stopped. Now he wanted to be paid for pushing the cart. I was so mad. Dan paid him. Not only did he PAY HIM - but when the guy was handed Sri Lanka Rupees, he pushed it away and demanded US dollars. Which Dan paid him. Sometimes I hate being a physically small woman. If Dan had been pushing the cart I guarantee you he wouldn't have been treated so. I do understand he was only trying to make a living, but do not appreciate his tactics. It made me very uncomfortable. Thankfully I can say we were not treated like that again. The taxi brought us the 15 minute ride to Negombo and our hotel. The Golden Star Hotel lets out right onto the sandy beach of the Indian Ocean. Yeah!!! We were greeted with a welcome drink (think tang on steroids) and shown to our room. It was simple. Basic. Not fancy in anyway. It was also a room at the ONLY hotel that replied to the masses of emails and faxes I'd sent trying to arrange a room at all. Thus - IT WAS PERFECT! It had a private bath and a view of both the pool and beach in the distance. We had a room with half-board (breakfast and dinner included), so we headed down to the dining room to see what was on offer. It had been quite a long day. Upon arrival at dinner we realized that we were the only guests under 65 in the joint. This was fine as it also meant there were no rowdy and obnoxious tables of overly drunk young travelers. The menu was small but complete and we hit the salad/bread table to start. I enjoyed my glass of local wine which I followed with a Pina Colada while Dan enjoyed the local beer. 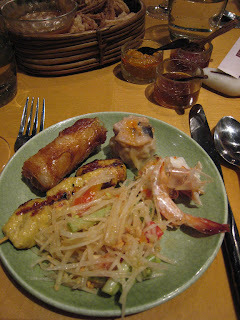 I tucked into the shrimp plate (above) and Dan enjoyed the curry dish he got. It was filling but not fantastic... which is not a complaint. I'm writing this having already been through the trip and can safely say the local, not tourist food, blew it out of the water. But alas, I'm getting ahead of myself. These little fellers were everywhere out hunting for dinner I'd guess! The swim tired us both right out! Time for sleep. We have an early wake up set to catch the sunrise! What a long few days. Work ran over (don't ask - very frustrating) and sadly, all of my free time that I'd planned in was eaten up. Yep, my entire free day - whoosh - gone. Well... Up until 4pm today at least... We had tonight "free." Dan and I arrived at the store...um...it was a photography studio? Shaded lights, an old desk and a few chairs blended in with the single computer and filing cabinets. I inquired about the camera. The owner had received the call from our hotel. He asked us to take a seat while he got on the phone and began making multiple calls about the camera, with "IXUS850IS" being the only part I understood with each call. Finally he turned to us and said, "Waiting very BRAND NEW piece from factory." Um...yah, that's the point, no? I found it funny enough to immediately write down exactly how he'd said it. One hour passes and we are still sitting on stools by the shabby chic desk. A runner arrived with a bag containing a camera, case etc. I opened the bag to inspect and the new box reads "IXUS800IS" not "IXUS850IS". It's the wrong camera...the one with the plastic back...the one most likely to break...I'm not buying it. Words are said from the owner to the runner. Calls are made. Phones ring. More calls. We wait. 1 hour and 45 minutes have passed. A woman that has been in and out sits in his chair and strikes up a conversation with us. She's the wife of the owner, Nepalese and comes from a well to do family. This we learn in the first few moments as she let's us know that he father owns a large international hotel chain inquiring if we knew of it (which we did - you would. It's big.) We chatted and chatted and chatted... Chai tea arrives. The time moves so slowly in the dull low ceilinged florescent lit room. I get up and look at the photos on the walls of Bollywood and International stars as I'm told her brother-in-law photographs all the stars. She talks on about how difficult it is for her sister who is married and living in Connecticut in the USA. She asks how we do things in the USA, being that we don't all have help? Her poor sister has to cook the meals and take care of her two children all by herself! Without a live-in? Terrible, no? She then said how amazing it was when her nephews would come to visit, they would make their beds when they got up and could even get their own cereal, all at age 8! Her own children who are late teens early twenties didn't even do that. (They have household help and still live at home.) Interesting the differences in how people are brought up. It's cultural here to have household help. We wait. 2 hours and 15 minutes. In times and places like this you have to wait. If you leave to come back later, nothing will get done...so, We Wait. Finally - 2 hours and 40 minutes later - my replacement camera arrives. Yeah!!! Sadly it ate up our entire touristic evening, but I'll have a camera for the rest of this crazy world tour!!! The staff at India Jones was extremely attentive, with 2-3 people stopping by from time to time for different things. 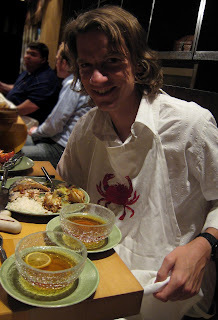 Upon deciding on our order, I followed our waiter through the kitchen to the tank in the back to select our crab... upon arrival I chose the only one they had. Boy oh boy was he BIG!!! 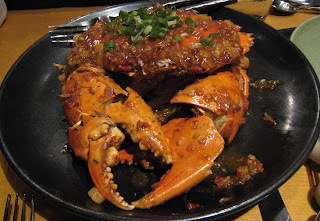 Next we had Singapore Chili Crab (left) which was a blue crab when I'd seen it pre-cooked (yes I knew it would change color-- but it was so pretty in its blue coloring.) 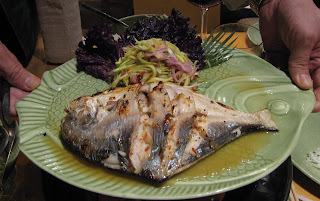 We also had a Pomfret fish common to Bombay (right below). Yum yum yum! They even gave us lovely embroidered cloth aprons to protect our clothing from the Crab-ness. The wine was tasty, the service good and it was mere steps from the elevator that brought us to our room for a good nights sleep. 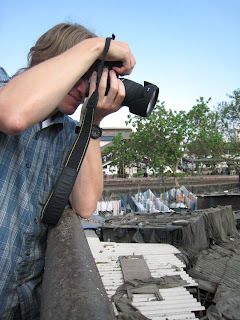 Tomorrow morning it's whirlwind touring of Mumbai on our way to the airport. Then...Sri Lanka here we come!!! 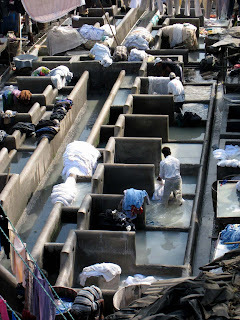 Today's factory in India makes scarves and cover-ups, not hats. 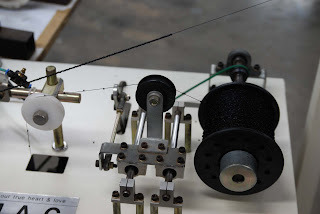 They have been expanding their automated knitting/machine knitting capabilities over the past few years. Big machines, their systems and training to run them can run into the hundreds of thousands of dollars, so everything moves slow and deliberately (and controlled.) Controlled growth is key! 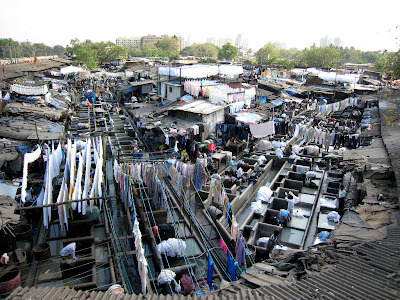 Unlike my factories in China, there are no dormitoried housing facilities provided in India. The exception of sorts is during high season when workers are sent for from towns many hours north of Mumbai and must be provided room and board in order to have them sign on to come work. It's provided locally, but not AT the factory as it is in China. Thanks to Dan, there are photographs. My camera worked intermittently and I really only got one or two shots that are at all usable below. Thanks Dan!!! Any of these shots can be clicked on (Open in another window as I don't have them set to pop-up) for more a detailed view. Enough background... Shall we take a tour? The bulk of the knitting that I saw being done was on hand run knitting machines. This is a slower time of year for production (it's about top pick up) thus not all machines were being run. When at full capacity, having brought additional hands down from Northern India, this room is PACKED. The workers have likely learned their skill from their father (note all of the people running these hand machines are men.) Those who come from the North are already trained enabling them to just jump in and go. They stand, mainly barefoot on a towel or cardboard or nothing (they set it up per their own comfort), thread the machine for the specified job and voila! (Note, the fellow in the background in the photo at the left... yes, those are his trousers hanging from his knitting machine. I suppose that is cooler in shorts?) They're off! Today they're making striped scarves for a large international store group (you may just see one in your local mall soon.) 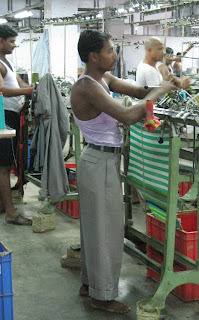 The workers are told the gauge of how many rows per stripe width and what order the stripes must go in. 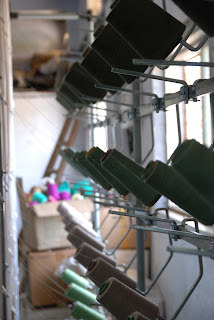 They place the yarns (dyed at the dying factory) in stripe color order and count the rows for each stripe as they go to make sure all scarves are uniform. The job of working a linking machine is one I find amazing. They sit and thread knit stitches, each individual stitch onto a single pin in a single fine row - at rapid speed no less!! I'd guesstimate 20-26 pins per inch? Maybe more? WOW! Once threaded the machine zips across providing a finished edge. The extra (perhaps like selvage) on the ends is simply snipped away then. I fear that my eyes would go blind if my job was to work the linking machine day in day out, but these guys are FAST!!! Again, it's all men running these machines. Just after the linking is finished, the items are inspected for every knitters favorite thing... DROPPED STITCHES!!! 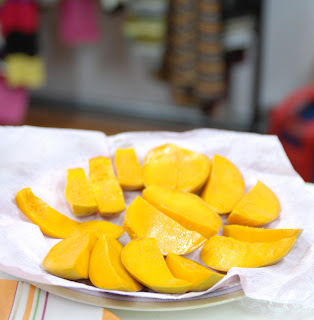 Depending upon the content of the item it may be washed first, then pressed then washed again and pressed/blocked again. Or washed then pressed and blocked... So many options, each done to a precise recipe to make the finest quality product available. Have I said in this entry how amazing this factories capabilities are? There are restrictions on automated machines... they can handle fewer colors than the hand run machines for instance. The photo at the right shows one of the tubular knitting machines. It moved FAST!!!! AMAZING to watch! There were two men (one clearly of higher rank than the other) watching every move this machine made. Any slightly "false move" that was made near this machine was corrected immediately as not to allow a single "flub" in the fine and delicate fabric that was being knit up. It was surrounded on four sides with what I'll call "spool walls" containing rows and rows of yarn spools all feeding into the machine. (50 per wall) Yeowza!!! The easiest way to get thew beads on the fabric is actually to weave or knit them INTO the fabric... To the left you see a woman sitting in front of a bowl full of beads that she spins and beads slip onto the needle. 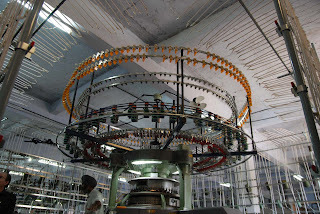 This thread of beads is put into the machine (above) and the beads are knit into a string that will later be woven or knit into an item. Pretty cool!!! The vast capabilities they have here --- WOW! I can't wait to dig in!!! Oh - so many photos here that wouldn't fit! I'll have to post more on my Flickr page! As with any business trip, I'm here to work. This means it's often the "getting there" where I get to see most of the culture. Is you peer out the window you have to decipher what you see in little bites until you have the full story. This often involves a long continuous list of "what's that" "why does that have a" "is that the norm?" etc. to whomever is sitting near me, local and speaks English. 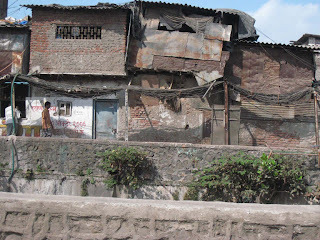 Shown at right here is a view of housing that I saw daily as we left central Mumbai. One of the things that I saw a lot on these hour+ long drives to the factories, were the families sharing the mopeds/motorbikes. Although I've see it so many times in China, it amazed me to see the women riding side saddle due to the restricted movements in their saris. Often is was four people with a second child seated between the parents. Almost no one uses a helmet either, although the government is desperately trying to enforce this compulsory law. 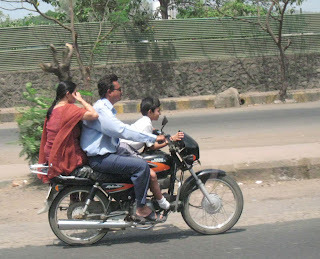 They certainly don't have the man power to stop every bike with non-helmet wearing passengers. Instead, they are using signs, like this one at right, at toll booths that you must pass through when traveling 40 minutes outside the center of Mumbai. Another option are the Auto-pedicabs (shown left.) They were out in droves this morning. I didn't see them within Mumbai center much, so I'm not sure what their driving restrictions are, but just outside the center -- VOILA! They are about as wide as 2 seats at the cinema, smooshed together and are set-up like a trike with 2 wheels at the back and one front. The driver most often, from what I noticed, is barefoot and sitting on one foot casually as he navigates the traffic and roads. Three people are often seen to have poured themselves into the back, sitting upon one another in order to fit. Yes, it's a less expensive mode of transportation from the taxis that also abound. A I travel, I find myself trying to imagine what it would be like to live in which ever country I'm visiting. What would I be up against if my finances or class level kept me where I was without much chance of change in my lifetime... A hard thing to think about. 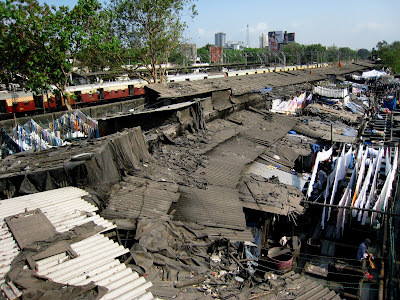 This morning on the way to the knitting factory, we were treated to a stop by a Mumbai landmark. Dan and I couldn't help but stare in awe before grabbing our cameras and going for it. I was hoping my camera would work for a few more minutes (it was slowly dieing), and it didn't let me down. Even let me get a few moments of video (see it at the very bottom of this blog entry)! 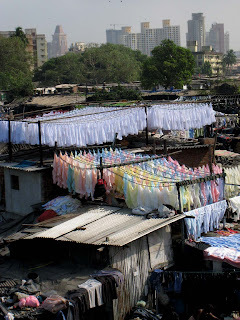 This is where the hotels, restaurants and many households send their laundry to be done. It extends nearly as far as the eye can see!! An amazing sight. To the left of the area where laundry was being done you can see the commuter train, at times bursting with people. Some hanging on as they half hang out the door. I have so many photos of the laundry...but only space for a few!!! There are just SO MANY PEOPLE here. Everywhere you look - people. You can tell this a bit as you watch how they interact with each other and how they walk. Very little personal space is accounted for. Everyone walks very close to one another...something I see in China and Hong Kong too. I suppose when you put this many people into a small space you don't learn what it's like to have personal space. It really makes you appreciate it when you have those few moments where no one is so close to you. I sometime have to remind myself that people aren't being rude and that their culture is different. It can be very overwhelming when walking through crowds. Let me begin by saying all information presented here was directly told to me on the long drive to the office today. 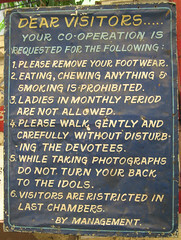 I'm not sure if these traditions are the same all across India, or simply in this region...but it's a heck of different way to do things than we do it in the USA. Also, there are so many photos that I wanted to show that I've stuck them in along the way. There are zero photos to go with the top story...they most all go with the bottom story. My vendor's niece lives some hours outside of Mumbai in a small city. She put her, I'll call it, "marriage CV" (the best photos you can have taken, age, size, weight, like/dislikes, education, class etc.) in with a matchmaker (I think from her church) who had found a young man in Mumbai that liked her CV and whose family wanted to start the introduction process. Keep in mind that Women in India get married usually between ages 17-24, while men get married from 20-25ish. In India I'm well an Old Maid. This gal is in her early 20s nearing the end of her prime marrying time. Because her Uncle is of good class and is well respected in Mumbai, where the young man lives, she journeyed to her Uncles house and now her Uncle would act as her guardian for the process ahead. He got the call on Friday that he and his wife and family would be expected at a tea on Saturday afternoon that was being presented by the prospective boy's family. He and seven of his family members, all adults of good standing, went to the tea. The young man and young woman were NOT invited. The families take time to chat and size each other up to see if they think the families would be a good fit for each other. The outcome? The families call the young man and tell him to come to the tea. The young woman is summoned for as well and they are allowed to meet. Being that both of the families involved are rather modern, the two are allowed to go out to dinner and a date that evening to see if they are fond of each other. Had the families not been modern, they would have gotten 30 minutes alone together in a room to decide whether he is interested in her or not. In that case, if he was interested and her family also thinks it's a good match, she will have to marry him even if she's not interested in him. Divorce is not accepted and thus many a bride has been known to kill herself shortly after the wedding. But back to "modern" times. My vendor's daughter, almost of marrying age, went along on the date so the young lady would not be alone with a strange man. He picked her up in a super fancy car. Brought her flowers (something that's rarely if ever done in India.) She was pleasantly surprised by both. The outcome? The date was not good. She didn't like him at all. When telling her family she didn't like him WWIII broke out. Her Mother was convinced he was from a good family. 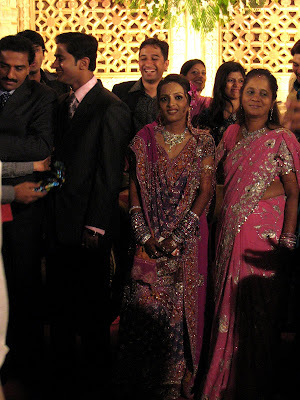 As a woman in India, having a good family (in-laws) is seemingly more important than a good husband. Once married you will likely live with your in-laws. It's rare for a young man to have his own home. You may also be living with the sisters, brother and their spouses...all under one roof. So you'd best get along with the Mother-in-law and sister(s)/sister-in-law(s), or your life will be hell. After the date, her family waits. They wait to hear from the boy's family. It can be mere hours or days...or you may never here from them again. Sunday morning they received a phone call from his family, and a second meeting was requested. This means my vendors family now had to present a fancy tea to the boys family. Approximately 10 people from the gals side went to the tea...and almost 30 people from the boys side arrived. They can bring as many people as they want. They are all interviewing the gal's family to make sure she's a good fit for their boy...after all, even if she and her family likes him, if he says no, a mark is put on her family. Her family sends word through the matchmaker, an announcement at this time of how much they would be spending on the wedding. This shows not only their class level, but how much they care for their daughter. 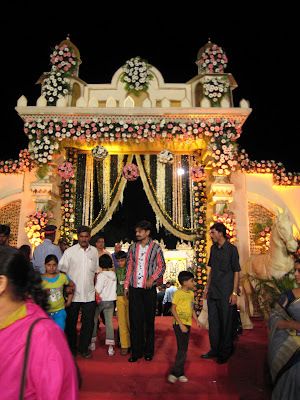 A small wedding costs $100,000 USD with around 1000 people attending. (I don't even know 500 people!) From how it was phrased, I think they would have had to say a larger number for this gal. All of these things must be thought through very carefully even BEFORE the first meeting of the families. Nothing can be done to loose face along the way. Both sides decide the kids should go for a second date. Begrudgingly the gal agrees for her Mother's sake and a lunch date is had. When asked, even her cousin, my vendor's daughter, says she doesn't favor this boy for her cousin. She can say no more in case her cousin ends up marrying him. She too cannot loose face. Date two...not good. The bride returns home telling her family absolutely NO WAY will she marry this man. His family calls, still eager and interested in the gal and invites her family to their home for tea. The adults go in order to see where their girl would be living. It was a very very good thing they accepted the offer for tea at the prospective new home. HORROR! The house, although seaside, is a sliver of a house. Almost no windows (none facing the sea, no air circulation) and no room for yet another person. It was described to me as having had tea in JAIL. They returned home to tell the girl she wasn't going to marry this family. They suddenly realized that it was likely the boy had even borrowed or rented the fancy car to woo her. This family was not of the same class level -- and had she married down - - oh the shame on the family. Of course the bride was furious that she had been put through all of that knowing she didn't want him from the start. She now goes back to the start and hopes for a better candidate once she has calmed down enough to consider trying again. 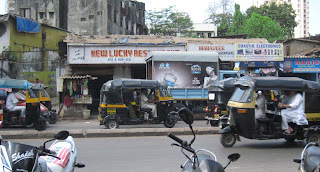 Photo at top right: A "Just Married" car outside a restaurant in Mumbai. This is wedding season. It's an auspicious time. 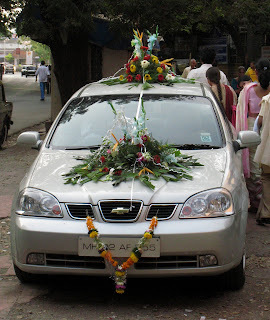 Monsoon season is just around the corner so the wedding business is buzzing in Mumbai right now! This wedding we were attending was the son of a middle class man who seemed to volunteer all over Mumbai with various organizations. 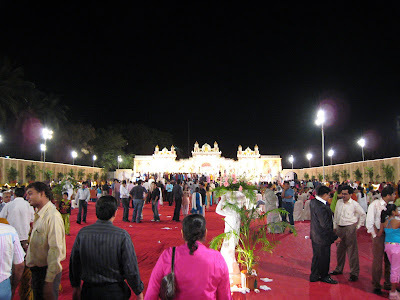 It was a middle sized wedding... only 5000 or so people in attendance. Yes, I said 5000. Everyone he knows is invited. The mailman, yep, him too. We arrived at almost 11:45pm and the reception was still hopping! My boss decided to return to the hotel instead of joining us for the festivities , so Dan and I were on our own with my vendor and his wife. This open air space was huge, the size of two football fields in the shape of an "L". From the street you may have thought it was a stadium the way it's lit up! 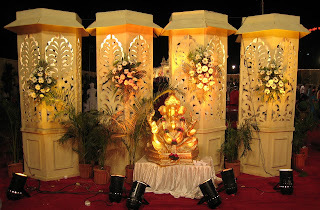 You enter at the corner, through a gilded and flower covered archway (top right photo) greeted by a golden statue of Ganesha (shown second photo from top right). Ahead of you in the distance is a stage (Second photo down on the left lit up like Disneyland) with the bride and groom on it. 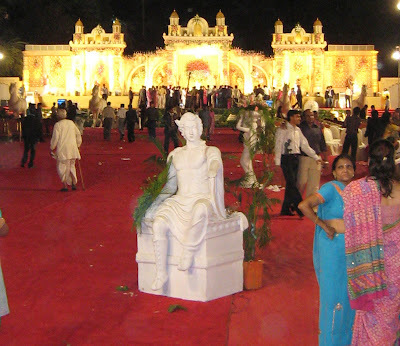 Facing from the stage you see HUGE statues of horses and waterfalls. (Third photo down on the right.) The goal was to make this location look like a Palace of sorts. Yeowza! As you walk around you see random statues of warriors or Greek Gods (we weren't exactly sure) all to fit into the Palace theme. 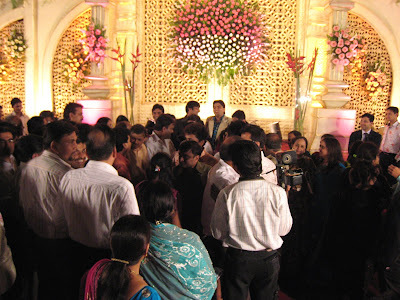 People lined up for HOURS for their turn for a photo with the new couple. The bride looked 19 to me, the groom perhaps 24. They had been standing there for HOURS. The beautiful bride wore an amazing bead encrusted dress, said to add 10kg to her weight. (That's a damned heavy dress to have to stand in with a smile on your face in the heat for hours.) That wasn't including the added with by the stone encrusted bangles or necklace! It is her duty to stand and greet and smile and thank and nod quietly at the side of her now husband. It's hard to say if she had a single meeting or many with him prior to the marriage. I caught her eye for a moment in this photo. She looked down at the floor and then back up and me and smiled exhaustively at me as I smiled and gently nodded to her. With a blink she was back in place attending to her guests. From here we walked off the stage and towards the seating. Big over stuffed love seats and chaise lounges had been laid out to rest weary feet were located in the long part of the "L" parallel to the stage, to one side. These girls looked so beautiful in their modern patterned but classic saris. I LOOOVE the one on the far right!! Just beautiful! The area that had housed the actual wedding ceremony was in the bottom part of the "L" where the food was now displayed. Food tour time. The night was winding down and man of the food station had closed. We were brought around to see what a food presentation at an Indian wedding was like...but not to eat. (Not because there wasn't enough, but because out vendor suggested we abstain since we had no idea how many hours it had been out in the heat! Wise I think.) Some of the presentations were interesting too. Below right is a display for South Indian food. 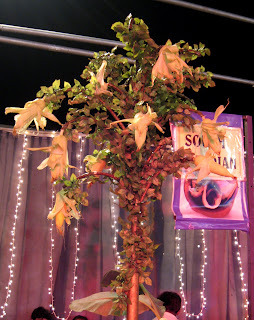 They used corn (on the cob with the husks) to make flowers that hang from the "tree." There were food stalls lining the outer edges of the huge space as well as free standing tables spread out around the middle. On one end was a single "U" shaped seating area that had been used for a small sit-down meal for the bride/groom and family. 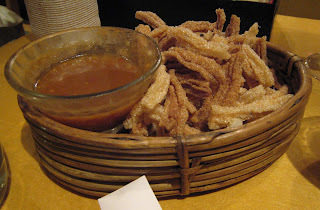 Everyone else ate buffet style, wandering and unseated. Remember, the seating area is in the other section of the "L" nearer to the stage. The tables in the background of this shot each had different types of cuisine on offer. Including a few Chinese tables and even a Baskin Robins!! Crazy. After our very interesting peek into this wedding culture, it was finally time to call the day to an end... we needed our sleep. 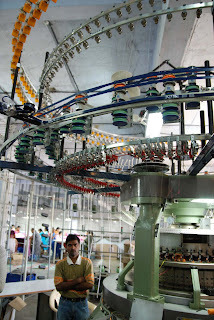 Tomorrow's our last full day in Mumbai and we've got a knitting factory to see!